The United States Department of Homeland Security’s (DHS) Procurement Innovation Lab (PIL) has issued a new Request for Information (RFI) pertaining to the proposed U.S.-Mexico border wall. The RFI is different from the earlier Presolicitation Noticed issued last week by DHS, which has already garnered responses from hundreds of interested parties. The PIL is housed within the office of the Chief Procurement Officer at DHS and this new order seeks to “to solicit ideas from industry and other partners for the more comprehensive long-term strategy related to the border wall.” The call also asks for firms, nonprofits, and other interested parties to submit white papers in pursuit of “innovative ideas to design, finance and complete construction” of a “complete physical barrier” between the United States and Mexico. This Request for Information (RFI) is being issued by the Department of Homeland Security (DHS), Office of the Chief Procurement Officer (OCPO) under the auspices of the Procurement Innovation Lab (PIL). The information requested under this RFI is separate and distinct from Presolicitation Notice 2017-JC-RT-0001, which was posted by the DHS Customs and Border Protection (DHS CBP) Procurement Directorate, and any Request for Proposals (RFP) flowing therefrom. That presolicitation notice, any amendments, and the anticipated RFP will, of course, be authoritative with respect to themselves, notwithstanding anything in this RFI. Thematically and conceptually, the RFP anticipated to follow the CBP presolicitation notice is designed to focus on a very near term effort. Some of those designs could become prototypes that will, in turn, advise the development of requirements for the actual wall. The details of the RFP are still under development, but it could include provision for construction of an initial segment of the wall. The procurement of the complete, extensive wall will come sometime later. Interested parties should note that participation in Presolicitation Notice 2017-JC-RT-0001 and any related procurement does not preclude offerors from participating in this RFI, and participation in this RFI does not preclude offerors from participating in Presolicitation Notice 2017-JC-RT-0001. The purpose of this RFI is to solicit ideas from industry and other partners for the more comprehensive long-term strategy related to the border wall. There are many other considerations for completion of the border wall. DHS recognizes that industry, other agencies, and other private entities may have interesting and useful ideas about how we could proceed. We would like to invite submissions of any such ideas so we can consider them as we develop a complete and comprehensive long-term strategy. This strategy will need to accommodate the entire Southwest Border, which has a quite diverse range of terrain, foliage, population, wildlife, and other features. Exemplar areas of the Southwest Border where we might initiate more extensive construction could include the Rio Grande Valley in the southeast of Texas, the area in and around El Paso, the desert along the Arizona border, and the area south of San Diego, California. • Models for financing, constructing and maintaining the wall. • Multi or dual use functions for the wall and/or wall corridor. 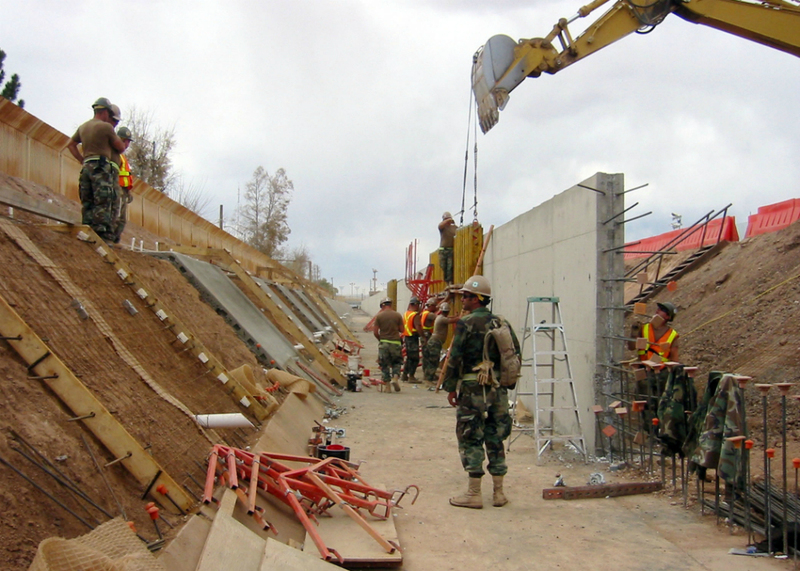 • Tools and methods to determine the best type of wall for each section of the Southwest Border. This would include the ability to tradeoff security capability, acquisition, life cycle cost, useful life and other factors. • Technology that could be incorporated into the wall that would contribute to border security and agent safety including but not limited to, sensors, cameras, access roads, brush removal. • Proposed business/contract terms and conditions that would optimize risk avoidance for DHS and its business partners in providing strong security quickly, efficiently, and effectively. This would include, but is not limited to whether this endeavor should be a contract or grant, partnership or financial assistance program; necessary length of an agreement, benefits of one partner vs. many different partners on various areas of the border and major deviations from federal law or regulation necessary to make this innovation possible. • How to bring economic benefit and jobs to the regions (states, counties, cities, individuals) cooperating with DHS on the wall project. White papers should be no longer than five (5) pages. If known, the papers should identify the largest obstacles to accomplishing the idea and proposed methods of overcoming the obstacles. Alternatives within a proposed model are encouraged. DHS may set up meetings (in person or telephonic) with respondents whose white papers, in the opinion of DHS, have merit and value in further discussion. A response to this market research is not required to participate in future acquisitions. Similarly, DHS’s decision not to continue communications regarding a white paper does not prohibit that respondent from participating in future acquisitions for this program. Nonproprietary responses are preferred but DHS will also consider responses marked in total or in part proprietary. Please note however, that DHS does not consider these responses unsolicited proposals nor does it intend to award a sole source contract from the responses to this market research notice. Therefore, nonproprietary responses are of the most value to DHS as it proceeds forward with the wall. This RFI is for planning purposes only and should not be construed as a Request for Proposal or as an obligation on the part of the Government to acquire any services or hardware. Your response to this RFI will be treated as information only. No entitlement to payment of direct or indirect costs or charges by the Government will arise as a result of contractor submission of responses to this announcement or Government use of such information. No funds have been authorized, appropriated, or received for this effort. DHS may use the responses to inform its development of future border infrastructure requirements. Interested parties are responsible for adequately marking proprietary or competition sensitive information contained in their response. The U.S. Government is not obligated to notify respondents of the results of this survey. The purpose of this RFI is solely to conduct market research. Classified information should not be submitted nor will it be accepted. The Government will not return any materials submitted. Responses are requested by March 31, 2017. More information can be found on the Federal Business Opportunities website.